Hi, I’m Travis. I’m a junior in the Materials Science & Engineering undergrad program, and I harbor a special interest in what I call “heritage materials.” I only happened upon “Recreating Ancient Greek Ceramics” when searching for a materials science class, “Ceramics”, in our class-search system. In previous semesters I’ve taken “Ancient Americas Metallurgy” and “The Physical Science of Paper”. I find the cross-section between materials of the past and modern analysis to be academically thrilling. The class gets one last period of reflection over the ancient works as the portable x-ray fluorescence instrument gets set up. With just two weeks left of class, the Recreating crew met for one last lesson, exploring just who the Greek potters and painters were, where they worked, how they worked, and also the characterization technique of portable X-Ray Fluorescence spectroscopy (XRF). This end-of-the-course class had a particularly heavy reading load, as we explored ancient Greek ceramics beyond their mere technical fabrication, harkening back to our first lecture with Dr. Alan Shapiro. We turned our eyes towards the workshops that produced the wares, reading the works of Elizabeth M. Langridge-Noti, Dyfri Williams, and the recently published paper of the day’s guest lecturer, Philip Sapirstein, “Demographics and Productivity in the Ancient Athenian Pottery Industry.” (See references below). All of these papers zoomed us back in time to the ancient city of Athens, wherein clay wares permeated the urban landscape, from the workshops stationed next to major trading routes, to the commercial wares stands within the Athenian Agora, and even beyond, in long-distance commerce, to the regions around the Mediterranean, full of consumers hungry for the expertly-produced, fine Greek masterpieces. Using the power of the internet to watch and listen to Dr. Philip Sapirstein (the red arrow points to him). 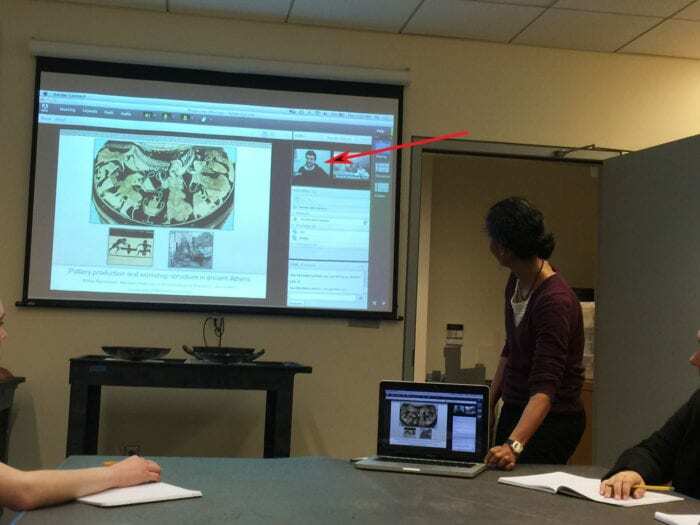 After discussing the readings we found ourselves once again powering up the typically finicky technology that attempts to link us over video-call to the academics who otherwise would not be able to share with us their work in the field. Dr. Sapirstein, beaming in from the University of Nebraska-Lincoln, led us on a guided tour of his highly refined catalogue of potters, painters, potter-painters, and their extant corpora of vessels. His classification builds upon the landmark work of J.D. Beazley, whose index we explored regularly in Recreating. As Dr. Sapirstein presented, familiar names like Makron and Douris assumed identities beyond the slipped signatures they signed on their wares, as a network of them and their contemporaries were compared head-to-head in categories such as work span, number of works, and the number of people they worked with. Such a robust system was necessary in order to answer the larger question of, How large was the Greek pottery industry, and can we identify how productive vase painters were between the 6th and 4th centuries BCE? According to Dr. Sapirstein, the available evidence suggests that the more prolific specialist painters (about 36 in total) produced, on average, 8 vases per year. The students had so many questions for Dr. Sapirstein at the end of his lecture that it was startling to look dubious whether we’d even get to the XRF lesson, which I had been looking forward to for a while. Luckily a quick show of hands revealed we as a whole still wanted it, so we set up the instrument to examine our fired tiles, and to compare these analyses to those completed on the ancient examples in the museum. X-ray emission peaks for iron, silicon, titanium, aluminum, zinc, and many other elements arose in pairs when the analyzer fired its high energy electromagnetic waves at the unslipped back of one of our fired tiles. The spectrometer hummed as it pulled a light vacuum over the sample, in order to minimize interference from the air in the room. Balachandran gave a quick remedial lesson in electron orbitals, and the excitation energy they emit when they are struck with a sufficient amount of energy, and fall back down into their lower energy state. As a materials science student, I had learned about this technique in previous classes, but it was a delight watching it work in person. Although the results of the analysis don’t speak for the quantity of elements in the sample (portable XRF is a qualitative technique), they can be compared relatively to one another. So when we turned the tile around, and analyzed the slipped side of the tile, we indeed saw a difference—namely, higher potassium content which was likely from potash added to levigate the slip, as well as higher iron peaks, possibly associated with the more dense, vitrified slipped areas. A tile that had been slipped with a special slip prepared by soaking in zinc sulfate (or white vitriol) showed a significantly more intense zinc peak, something has been suggested in the analytical work of Dr. Marc Walton and his colleagues. This concluded our penultimate class. Williams, Dyfri. “Greek Potters and Painters: Marketing and Movings.” In Pottery Markets in the Ancient Greek World. Edited by Athena Tsingarida et al. Brussels: Centre de Recherches en Archeologie et Patrimoine, 2008: 39-60. Langridge-Noti, Elizabeth. “’To Market, To Market’: Pottery, the Individual, and Trade in Athens.” In Cities Called Athens. Studies Honoring John M. Camp II. Lanham: Bucknell University Press, 2014: 165-195. Sapirstein, Philip. “Demographics and Productivity in the Ancient Athenian Pottery Industry.” In Athenian Potters and Painters. Volume III. Edited by John Oakley. Oxford: Oxbow books, 2014: 175-186. Great post! The aspect of Dr. Sapirstein’s research I found most interesting was the fact that he was able to chart the years of activity of each identified potter, painter, and potter-painter used in his study. His results showed that before 550 BCE most potters were also painters, and that specialist painters didn’t emerge until ca. 530 BCE. This corresponds with the invention of the red-figure technique (which is much harder to execute than the black-figure technique), and would explain the sudden need for specialists. I wonder what kind of impact this division could have had on the pottery production craft. What kind of implications could it have on the relationship between potter and painter? Could the increased level of skill needed for painting in red-figure have given painters a higher status over the potter? I am glad we used the XRF. I agree with Travis; it was exciting to see concepts I’ve learned about in class in action! A topic that kept coming up was the completeness of the archaeological record. We don’t know what we’ve lost, so we may never have a complete picture of the Ancient Greek ceramics industry. I thought that an interesting insight into this problem was the collector who aggressively sought out Makron’s work, and as a result, the number of sherds and wares attributed to Makron is significantly larger than works attributed to other individual painters. No conclusive statements can be made about this, but based on the huge number of Makron attributions, we may be able to fill more holes in our knowledge about the Ancient Greek ceramics industry than we think. I was interested by Dr. Sapirstein’s emphasis on the mobility of the specialist painters versus the stationary life of potter-painters for its effects on ideas of workshop organization. Specifically, since specialist painters were mobile, Dr. Sapirstein suggests that they might not have had assistants, but rather would have painted entire vessels themselves. If this is true, how could one have apprenticed to be a specialist painter? Did only potter-painters take apprentices? It would be interesting to examine the pottery attributed to Dr. Sapirstein’s specialist painters to see if any of the flaws that are commonly linked to the work of apprentices, such as un-vitrified backgrounds resulting from the use of a different slip, can be seen on those pieces. A study like this could help us more thoroughly characterize the work habits of people in the Greek pottery industry. Perhaps specialist painters were more likely to take their sons as offspring? That would allow them to be equally mobile as they’d be moving as a family. I’m not sure if there are any known family ties between painters or even for potters. Sorry, as apprentices* not as offspring. Maybe there were vase painting schools? If specialist vase painters are of the same status as painters/artists today, they might not have had apprentices. I was particularly interested this week in the individuals who had influence over the potters and painters of ancient Greece. We view these objects now as precious art pieces, but in their time, they served a primarily functional purpose. These objects were made with specific customers in mind, both local and foreign. Ancient “art dealers” would have been aware of the different preferences of customers, and expressed these preferences to the artists. It is also possible that painters in residence would adapt their images based on the preferences of potters. The lecture from Dr. Sapirstein was really interesting and thought provoking, since he was talking about the craftspeople behind the craft instead of the craft itself. Using his logic, we could tie the craftsmen to an economic model of supply and demand, which was something we hadn’t really discussed. Because these people were making the cups to sell (as well as making lasting ancient artwork). And I was also glad we got to use the XRF, it was just like we had talked about in class. It also showed that our tiles can and will be used for further research, which is what we were hoping for from the beginning. I think it’s important for us to remember exactly how our cups would have gotten from the potter’s hand to the customer’s hand. Nowadays, it’s either a purely industrial process where people buy ceramics by the pack, a shopping experience where people don’t even go close to the makings of the pots, or a very artistic experience where people still select out individual pots from master potters. However, the lattermost is the rarest occasion, whereas in the past, it was the only occasion. Yet, I believe the status of the potter has improved tremendously over time and has changed from a physical laborer into an artistic professional whose own studio is a wondrous, fantastical place rather than the side of a dirt road. Great post, Travis! Something that Dr. Sapirstein brought up that I found very interesting was the relationship between the painter Makron and his apparently preferred potter Hieron. Dr. Sapirstein said that, unlike many other painters, it seems that Makron worked almost exclusively with a single potter, Hieron. He said that it is quite common to find painters that are attributed with working with a rather large number of potters, and that it is not quite clear as to why Makron had this apparent preference towards a single one. I wonder what kind of implications such a painter-potter partnership would have in terms of the social dynamics of ceramic production as a whole during the 5th century BCE as well as during other times. Great post! I was initially skeptical about the statistical analysis on the vases that survived today (Dr. Sapirstein’s presentation) because it was intuitive to wonder whether the majority of the vases that did not survive could affect the data. However, later on I realized that the analysis was actually very valid and a wonderful case in point of the Law of Large Numbers that is the central tenet in the field of probability and statistics! The vast number of sherds and pottery that did survive were themselves sufficient for the kind of analysis (e.g. average production per painter per year) that was presented. Very inspiring! Great post! I found it most interesting this week the idea that painters and potters were ostracized by society. Their workshops were by or in graveyards, outside of the city. We think of these works of art as masterpieces that transcend time, and yet the people of the time did not celebrate the people that crafted these works. Considering the fame that other artists have achieved, it is sad to think that they were ridiculed. To add to what Kelly said, it amazes me that elites looked down upon potters and painters due to their social status despite their skills. However, I don’t think they were ostracized so much as put in the laborer category and therefore possibly in a lower class than their customers, and they probably worked outside the city because of the kilns. As far as the location of workshops, their location outside the city where people would pass them on the road is interesting when considering how the visibility would encourage specific performativity, especially under the watchful eyes of potential customers. I was very skeptical of Saperstein’s presentation because he drew some very broad conclusions from a seemly small sample of evidence. However, he tackled many questions that we, as modern archaeologists and researchers, have: such as how productive were these workshops, and how many painters were there actually? Thus, his research is a good starting point, but there is much left to learn, and we many not be able to ever understand the entire picture. The XRF was what I was most anticipating in class! Not only were we able to see the machine in action, but I think our analysis of our own tiles is really important to understand how today’s archaeology works in concert with material science especially when we read so many sources on material science analysis. This class brought the focus on the workshops again and scholars attempts to create statistical analyses for productivity and number of crafts people. As Hana has just said, while Saperstein’s conclusions could be challenged he was thinking of some important questions and using rather useful methods. One of the main issues for scholars trying to collect information about specific craftspeople is ones ability to identify. I can understand how a painting or drawing style would be more easily distinguished from a potter’s style simply because scholars have trained their eyes to recognize those differences. If more pottery-based scholars could have a similar eye maybe there is a change to recognize different hands of potters and analyze their productivity rather than the painters.